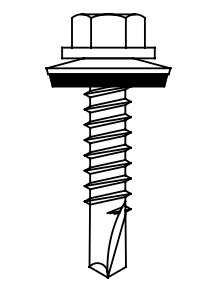 APPLICATIONS: The 410 stainless steel metal-to-metal fastener is designed to self-drill and join metal panels in roofing and siding applications. 410 Stainless Steel is magentic, and heat treatable. Provides corrosion performance for attaching steel, stainless or aluminum panels. Excellent drill performance in light, medium, and heavy gage applications.